The Joint Support Ship Karel Doorman is the largest ship of the Royal Netherlands Navy. The ship’s primary task is to supply other naval ships at sea. The ship can accommodate 300 people (including the own crew of about 150 people). Next to 600 km of cables, there is also a bakery, a bottling room, an elevator for up to 40 tonnes, and a ramp of 100 tonnes on board. The ship is equipped with a mobile state-of-the-art hospital consisting of two operating rooms, a ‘High Care’ ward, an X-ray room and a sick berth. Three surgeons can operate at the same time in case of emergency. 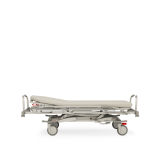 Haelvoet furnished the hospital with hydraulic beds and stretchers. The beds and stretchers have been equipped with specific floor fasteners. 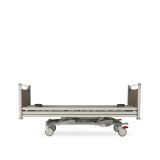 These can also be loosened so that the stretchers can be easily used for transport. Our hydraulic high/low systems increase the mobility and availability of the material.